Ever thought of running your home appliances without worrying about your utility bill? Really, in Malaysia? Isn't that the familiar catch line of a spam mail? Is it possible? Short answer: Yes. It is possible. Our monthly bill is about RM180 to RM250 monthly, depending on how energy-wise we are on a particular month. I would like to trim that to, say RM30 to RM50 or even zero without having to switch of my fridge, air-conditioners, and other energy guzzling equipment. This is very much possible with the enactment of the Renewable Energy (RE) Act 2010. According to the RE Bill 2010, residential homes that produce solar energy could earn up to RM1.75 per kWh of electricity produced. Dewan Rakyat has approved the bill earlier this month and once it is enacted (hopefully next month) it becomes a law. Let me explain. Interesting? For me, it is. I say “net” as the energy that is fed back to the grid is the difference between energy that is produced by your home Solar PV System and the energy consumed by your home. Don’t worry about how it’s computed; SESB’s meter will do it for you. If your Solar System produced 200kWh this month and your energy consumption is 150kWh then SESB owes you RM87.50 (50kWh x RM1.75). That is an income. But if your energy consumption is 220kWh then you’ll be billed RM4.80 (20kWh x RM0.24, tiered). Without the Solar PV system, you pay SESB RM27.20 (150kWh x 0.24 & 0.16, tiered) and RM40.80 (220kWh x 0.24 & 0.16 & 0.28, tiered) respectively for the above cases. For a complete electricity tariff check the SESB Tariff Structure and Rates. The feed-in tariff works by giving you income when you feed in electricity to the power supplier (SESB) grid and only charge you when you consume more than what your Solar Power system produce. This tariff is applicable if your Solar Power system is generating up to maximum of 4kWp. The 4kWp refers to the size of the solar power system and in most cases is sufficient to power up a semi-detached house. For installation of bigger than 4kWp, the feed-in tariff is slightly lower. A bit expensive but the Bill has a provision for a guaranteed income for the next 21 years from the date of signing the agreement with your local power producers, such as TNB, SESB or SESCO. That is long enough a payback period and perhaps even outlast the lifespan of the solar panels. Let’s hope the cost to install solar panels for residential homes drops dramatically when more people start adopting, plus declining cost of the technology. It interests me and I may seriously consider this when the incentive is rolled out fully. Interesting article. I saw a similar review in the US about this, that user can actually sell electricity back to the company. 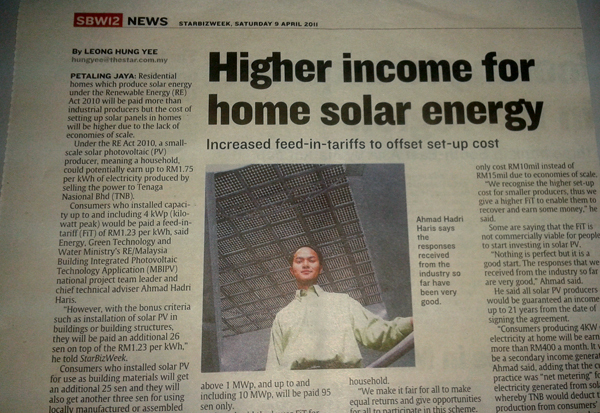 Solar cell is still new here in Malaysia and could be expensive to install and maintain, but this will be a start.. I want solar energy too. Kalau ada duit lah hehe. (gunsirit)- the main driver for local PV market would definitely be the feed-in tariff. Malaysia is now probably just behind China and Germany as the biggest PV producer. All indications are promising and hopefully the incentive will reach us soon. (sjb) - ada baitu, pelan-pelan kasi plan dia. Jadi juga tu. After reading your post i have a better understanding of what Generate Electricity at home and EARN MONEY really is.Your post have the information that is helpful and very informative. I would like you to keep up the good work.You know how to make your post understandable for most of the people.